We all know it’s coming. The end is near. All the prophecies about 2012 being the end of times; disasters throughout the world; global conflict; a down economy. These are all just signs warning us of what is to come. The zombie apocalypse draws near. I for one plan on being prepared when this hits, and as I am of a generous nature I will share with you some things you can do to not be caught off guard when the dead take over. So I present to you: strength and conditioning for the zombie apocalypse. Below are just a few things you can do in your strength training to be one step ahead of the game when this all goes down. Let’s look at the facts. 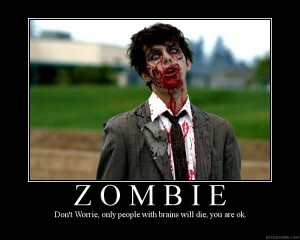 Zombies are slow moving, true, but their numbers will be great. Sprinting is one of the best conditioning exercises you can perform. First off, the simple act of sprinting helps make you faster. This is vital in outrunning the undead. It also might come in handy when outrunning other equally unfriendly survivors. Second, sprinting and other forms anaerobic exercise has been linked to an overall increase in aerobic output as well. Basically this means that you’ll be able to run longer too, at lower intensities. So if you need to get out of dodge into a safe zone, you’ll be in better shape overall and be able to run faster and longer. Pullups are one of the most valuable exercises you can do regardless, and it’s a shame that more people don’t train them, opting instead for crappy pulldown machines. From a survival standpoint pullups are vital. Need to climb a fence? Pullups will help. Climb a ladder? Pullups. Pull yourself up over a wall? Up through a window? Pullups again. Climbing a rope is an excellent, fun alternative to plain old pullups, too, and is just as functional if not more so. Try using different types of grips and adding weight (to simulate the bug out bag you’ll most likely be carrying in zombieland). You might also want to think about doing what some call a “tactical pullup”. Basically you pull your chest up to the bar, instead of just your chin/neck (increased range of motion). This helps simulate pulling yourself up to ledge/window/wall. I hate to use fitness buzzwords, but deadlifting is about as functional as it gets. Honestly, what is more useful in everyday life than being able to pick something up off the ground? After the zombie apocalypse hits, you may find yourself in any number of situations that require you to be able to pick heavy stuff up. Maybe it will be hoisting supplies. Perhaps it will be moving rubble to free a trapped survivor. More than likely you’ll need to be able to move stuff around to form a barricade. There really is no drawback to being strong enough to lift stuff up. Just as with deadlifting, the ability to pick up and manhandle something will be an invaluable skill after the end of times. Learning now how to manipulate things like sandbags and stones will make a big difference in your preparedness for surviving in a zombie controlled world. As stated above, these are precisely the kinds of things you might encounter in assembling a life-saving barricade. The TRX is an excellent tool portable enough to carry when fleeing the undead. Quite simply put, the likelihood of you finding a functioning gym in the zombie wasteland is slim to nil. In that case, it’s a good idea to start learning to manipulate your own bodyweight as a means of getting a workout. There are tons of progressions you can use so to build strength, power and endurance with bodyweight alone. This way you can still stay in peak, zombie-fighting shape without worrying about having access to additional training gear. If Plan A – ESCAPE – does not work, then the next step is defense. The last thing you want to have happen is to be out-fought hand-to-hand by a Zombie. With that in mind, it is important to include Grip Training in your routine. That way if you can get in there next to his throat, you can rip it out with a claw grip, or snap his back like a braced bend. If you are falling short in this arena, your best bet is to join the Grip Authority and let Jedd Johnson show you how to develop lethal hand strength that you can depend on during the apocalypse. These are just a few ideas to help you prepare in the event of the (some would say impending) zombie apocalypse. Better to be prepared then caught off guard. Good luck. Damn! No Grip Training or Bending? What if you have to choke one of those Zombies until their head pops off?